The Progress-Focused Approach: Progressphobia: what is it and how can it be cured? Progressphobia: what is it and how can it be cured? In the new book by Steven Pinker, Enlightenment Now, I came across a new word: progressphobia. 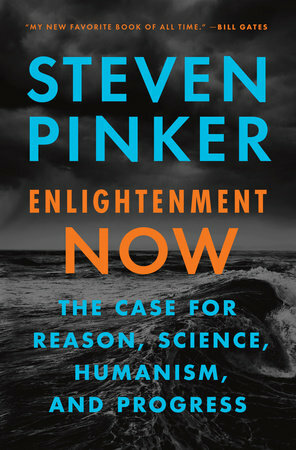 The book is a fervent plea for four central Enlightenment-ideas: reason, science, humanism, and progress. Pinker argues that the combination of these ideas means that humanity, through a greater understanding of reality, due to science, and an increasing circle of sympathy, caused by cosmopolitanism and reason, can make intellectual and moral progress. The aim of Enlightenment-thinkers was not so much to change human nature but to build institutions which would bring out the best sides of human nature. According to Pinker, these ideas need to be defended more than ever. These Enlightenment-ideas have been quite influential, not only in Western societies but also in many other places around the world. Yet they have also met strong resistance. Anti-Enlightenment-ideas can take the form of nationalistic ideas, religious dogma, authoritarianism, and different types of political ideologies. Sometimes it is thought that only underclasses of society are susceptible to such ideas but this is not the case. They are also, and have been for a long time, quite popular among cultural and intellectual elites. The value of reason, science, and progress is viewed by many intellectuals with cynicism and disdain. Progressphobia means the irrational fear of progress. While that word sounds good and sticky, I am not sure if it captures precisely what Pinker appears to mean. Because what he describes does so not much appear to be a fear of progress but a disbelief in the reality and possibility of progress. Pinker describes two processes which, together, lead to this disbelief in progress. The first process has to do with the fact that the daily news mainly reports about negative events in the world. There are two direct reasons for this. The first is that negative events often take place quickly, while meaningful progress often comes about slowly. The fact that the number of people who live in extreme poverty has been declining for decades is a fact which is seldom mentioned in the news. It is a slow process that takes place almost continuously but precisely because of that it is never considered newsworthy on a separate day. However, if there is a bomb attack or a plane crash, this is sudden and therefore newsworthy. The second reason why the news is mainly about negative events is that positive or neutral events are so normal that they are not considered newsworthy and are even considered as non-events. A high school shooting will certainly be on the news while, on that same day, hundreds of thousands (millions?) of schools had orderly or even good days. The second process has to do with cognitive biases which were implanted in us by evolution. A first cognitive tendency that plays a role in this is the availability heuristic. This means that we overestimate the probability of an event whenever examples of such events come to mind easily. A terror attack will come to mind easily because it impacts us emotionally and because news reports keep focusing on them for a long time. That is why we tend to overestimate how often such attacks occur. A second cognitive tendency is the negativity bias. This means that we notice negative events more easily than positive ones and are influenced more strongly by them. This bias reinforces our tendency to think that things are going ever worse in the world. This is reinforced by the tendency of media to focus more on negative news (If it bleeds, it leads) for commercial purposes. Taken together, this means that, although there is a lot of progress in the world, it is not visible to most people. Many more people think that the state of the world is in decline, while in reality the opposite is true. That is a serious problem. If you are not aware of the progress, it will be harder for you to believe in the possibility of progress. And the less you believe in the possibility of progress, the less you will be inclined to do your best to help achieve it. But what is progress anyway? But can we even agree on what progress is? The answer seems to be 'yes'. We can agree to a significant extent. We can define progress as an increase over time of whatever it is that we value. But can we agree on what is valuable? It certainly looks like that. It is easy to get an intuitive appreciation of what is valuable. We'd all rather have enough food than suffer hunger. We'd rather be healthy than sick. We'd rather have sufficient money than too little. We'd rather live peacefully than be at war. These and a few other intuitive notions closely resemble the Millennium Development Goals which were formulated in 2000 by the United Nations. And, as Pinker says, we have made great progress in all these areas, unfortunately without most people knowing that. In order to be more aware of progress, we need to get better at counting. We need to look closely at the trends in the statistics about all the things we value as human beings. And media should report a lot more on these trends. Is such a quantitative approach perhaps cold or heartless? On the contrary, says Pinker. Such a quantitative approach is actually morally enlightened because it does justice to the idea that every human life is equally valuable.